Hi guys, I am not pretty sure where to post this but I need some help. 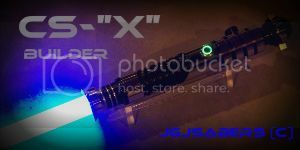 I bought Vader's and Anakin conversion kits but I got confused and bought the Luxeon Tri-Rebel LED with lens and mount. Will this work with the original speaker/battery? And will this be brighter than the single led? Can I wire the white led for FoC? Also I was not aware I needed resistors, so if anyone could give me some pointers I will greatly appreciate the help. You can wire all 3 at once, but not FoC and while itll work, itll kill the batteries faster than a single one would. You can play around with resistors (to reduce a die) to mix the greens and white though. Are you planning on using the stock board? Yes, I am, I want a simple conversion to start learning and as a gift for my son and daughter, so nothing too fancy. The RGB Tri-Rebel can still be used with the stock battery pack, but you'll want to use a resistor on the red regardless of whether or not you use either of the other colors. Both of those might look good with a custom mix of two of the leds. Its a Red/Red/White, is it recommended to link all 3 leds? or is better just the 2 Reds? And last but not least, which resistor should I buy? like in a local Radioshack or something.